A review of No Other Book: Selected Essays by Randall Jarrell, edited by Brad Leithauser, and Remembering Randall: A Memoir of Poet, Critic and Teacher Randall Jarrell by Mary von Schrader Jarrell. “Help! Help!” Randall Jarrell sometimes shouted from his desk. “A wicked fairy has turned me into a prose writer!” If the poet was indeed telling the truth, the evil enchantress did a bang-up job. She took a fine poet and made him a prose writer of genius. A reader of Jarrell’s essays never doubts that magic was involved. Literary criticism just isn’t meant to be so enthralling. Not so long ago it was usual to describe certain American poets as beloved by the common reader. Even today a few native bards can still bear that quaint but happy appellation—Robert Frost, Emily Dickinson, Edgar Allan Poe, Henry Wadsworth Longfellow, Langston Hughes, and E. E. Cummings at the very least. But there is only one critic—Randall Jarrell—who could credibly be called beloved. He is not read with detached admiration but savored with reckless abandon. He is the one poet-critic who is reread simply for pleasure. There have been more brilliant and influential poetry critics than Jarrell. T. S. Eliot possessed a more penetrating analytical mind. Yvor Winters displayed greater iconoclastic energy. Allen Tate offered more judiciously balanced judgment. A skeptic could, in fact, compile a long list of Jarrell’s critical shortcomings. He rarely offers detailed analysis of the poems he praises or censures. He shamelessly exaggerates the virtues and faults of the books he reviews. He has no interest in systematic thinking. Examined closely, his critical arguments often rest mostly on ingeniously worded assertions of personal preference. He demands the reader feel, taste, see, and hear a poem, not just think about it.If Jarrell had been writing academic criticism, these faults would have proved fatal. What he offered instead were essays of such compelling discernment, abundant invention, and attractive personality that the reader experiences them primarily as literature. Other critics wrote with formidable intelligence, but Jarrell poured his whole humanity into the form. His best essays, like “The Obscurity of the Poet” or “The Age of Criticism,” are not merely brilliantly perceptive and effortlessly erudite. They are also passionate, funny, unruly, and touching. He demands the reader feel, taste, see, and hear a poem, not just think about it. By the end of an essay, it hardly matters if one agrees with Jarrell. The journey itself was unforgettable. A witty commentator on the art of criticism, Jarrell understood the difference between his writing and the official academic variety. “We become good critics by reading poems and stories and by living,” he observed, “it is reading criticism which is secondary.” Then he added with mordant accuracy, “Many bad critics are bad, I think, because they have spent their life in card-indexes, or if they have not, no one can tell.” [Leithauser, p. 293] Jarrell understood the power of humor not only to hammer home a critical point but also to provide a human connection between author and reader. Otherwise criticism so easily becomes an arid and airless medium. Jarrell’s critical masterpiece was his first collection, Poetry and the Age (1953), but fine essays are scattered among three other volumes. There has never been a comprehensive selection of his essays and reviews until Brad Leithauser’s superbly edited No Other Book. 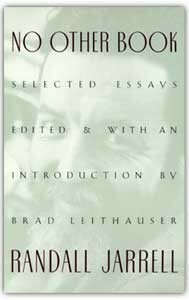 Leithauser reprints twenty-five essays on subjects ranging from Wallace Stevens to Rudyard Kipling along with a potpourri of short excerpts from Jarrell’s often outrageously tough reviews. (He also provides an introduction strong enough to stand against the works that follow it.) One cannot overpraise this substantial volume. These essays stand among the finest writing about literature ever done in America. Issued concurrently with the selected essays is Remembering Randall, a memoir of the poet written by his widow, Mary von Schrader Jarrell. In the three decades since the poet’s untimely death in 1965, Mrs. Jarrell has published several short memoirs of their life together. Remembering Randall gathers, reshapes, and expands this material into a charming and personable account of the private writer. The organization occasionally feels random, but Mrs. Jarrell proves herself so capable a writer—and so deeply interested in her subject—that the book is utterly engaging. When a family member writes a memoir of a famous author, the book usually represents either an act of love or revenge—nowadays mostly revenge. Remembering Randall, however, is an unfailingly affectionate and generous portrait. If Jarrell was consistently interesting on the page, he was—if his wife is to be trusted—absolutely irresistible in person. I cannot recall ever reading an account of a happier literary marriage. (Admittedly, the competition isn’t stiff, especially among Jarrell’s husbands-from-hell friends, John Berryman, Robert Lowell, and Delmore Schwartz.) I would be skeptical of such unsullied connubial bliss, but the author creates such a credible and intimately detailed narrative that I became a believer. When the couple met in 1951 at the Rocky Mountain Writers Conference, both were thirty-seven-year-old divorcees. The attraction was immediate, permanent, and exclusive. They formed, as the poet called it, “a group of two.” (One wonders, however, what his wife’s two daughters from her first marriage thought of this phrase.) Jarrell wanted and achieved “round-the-clock inseparability.” The couple not only ate three meals a day together, but Mary attended all of his classes and traveled with him to every reading and lecture. Jarrell’s all-consuming need for love and companionship surely originated in his lonely childhood. His parents separated when he was ten, and then lived on opposite sides of the country—the mother in Nashville, the father in Southern California. The young poet could not see one parent without losing the other. Jarrell’s poetry and fiction is saturated with loneliness and isolation which characters can overcome only by constructing makeshift families. After his failed first marriage, Jarrell managed just such a redemptive arrangement with Mary von Schrader and her two daughters. She was not only a wife to him but mother, sister, and best friend. This situation might easily have become oppressive to most women, but Jarrell had the abundant charm, humor, and devotion to make it seem a blessing. Remembering Randall is full of interesting and amusing episodes. My favorite is Mary Jarrell’s wry account of enduring both Gregory Corso and Jack Kerouac as six-pack toting houseguests. (Kerouac described his visit to “Random Varnum the great American poet” in his autobiographical novel, Desolation Angels.) Mary’s teenage daughter Alleyne was so concerned by Kerouac’s poverty that she gave him her two completed green-stamp books. What was the secret of a marriage that could survive not one but two Beat boarders? Mary Jarrell reveals only two of their conjugal rules—no reading at the dinner table and no cats on the matrimonial bed. Like most happy couples, they didn’t mind being a bit odd. How many other newlyweds have Arnold Schoenberg’s “Transfigured Night” as their song? Things went well until 1965 when Jarrell entered a long depression that ended in a suicide attempt. Six months later he was struck and killed by a car under mysterious circumstances. Mary Jarrell makes a cogent case for the accidental nature of his death, though others—without specific evidence—have declared it a suicide. He died at fifty-one. First published in The Washington Post Book World (October 10, 1999).